As of late, we have been attempting to make our home more energy efficient. Last month, hubs and I worked on the attic. We went to Home Depot and rented a "blower" to blow in recycled paper products into the attic. The insulation is also available at Home Depot. When you purchase as least 20 bales of insulation, the rental of the blower machine is free. The job was tedious and dirty. Hubs entered into the crawl space through the garage access and dragged the hose to the far end of the house (attic). I would then turn on the blower and start breaking up the insulation product while hubs aimed the hose to the areas that needed it most. The project took about 6 hours. This includes set up, actual blowing of product, and cleanup. Clean up was more than we expected. The insulation was ALL OVER the garage!!! It was a good reason to clean out the garage, so it all worked out for the best. Our latest project is to insulate our garage door. We have a double car garage, it the door faces directly west. The afternoon sun beats down on that door and heats up the now clean garage. So hubs went back to Home Depot to pick up a product called "Reflectix Insulation. The product comes in a roll. It is a foil with a bubble middle. The roll is about 50.00 dollars ( I do not remember how much a roll covers about 25 feet I think) but we bought two. Hubs has cut and installed the pieces into the door. Let me tell you, It drastically cuts down on the heat in the garage. So when you walk out into the washroom which is attached to the garage you don't instantly break into a sweat! It is wonderful!! As summer is directly upon us, the energy savings will be great! I just came across your blog today and I'm fascinated by the way you are able to get so many products for practically free. I don't ever shop at Walgreens or CVS so I don't really understand all the programs you mention. Would you mind emailing me to explain it in detail. I would really appreciate it! I have never seen a garage door product like this. I must give it a try! Was it worth the $100? Sorry, another question. How did your husband attach this to the door? The money for the insulation product was definitely worth it. The amount of heat that has been reduced is remarkable. I regret we did not have before and after temps, but it REALY does make a difference. He had put in two layers of the reflextix, so it is time consuming. But, the end result is to out benefit. We live in Central Florida and the heat that comes in through the garage door (faces west) use to be INTENSE. A new "insulated door" from Home Depot is around 1000.00 dollars...without installation. Thanks, Lisa! I am sending this to MY hubs and we are going for it! Thanks so much for the helpful info. We live in Texas, so we have the same heat issues. Hi there! Just stopping by through Sisterly Savings. This is a GREAT idea. We live in central FL and our garage really gets cooking during the summer, which in turn makes our room over the garage hot. I LOVE this idea. Thanks for sharing.. now I'm off to share it with my DH!! Insulating the garage dorr will definitely help to keep the heat out of the garage! Good Luck with you new project! I don't intend to spam your blog, but if you want to link to our website, it might help some of your readers. 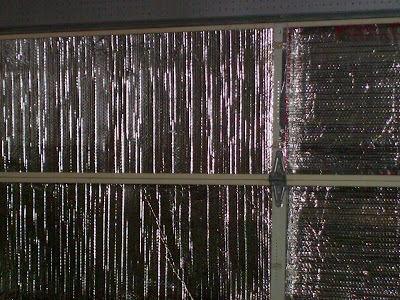 We make a garage door kits using that same foil bubble material. Both single car ($64.99) and double car ($84.99) door sizes. I never even thought of insulating the garage doors (to be fair, I don't have a garage :P), but it certainly would make sense. You can see through the cracks alongside my parents' garage doors, so it goes without saying that they are an energy waster. and I invite you to do the same. If it gets down to choose a correct partner utilizes your funds in a right way - that`s it!. hey man I like it. I'm about to write more posts and try out your ideas. After all, we always have something new to learn and being humble, I came here to learn. Bookmarked. That looks really great. I really think it all work out for the best. Thanks for sharing. It look really so great. If anyone buy home recently and proper built than I am sure that there is most likely proper and adequate insulation on the outer walls of the garage. This is a good way to insulate the garage making it fresh and cool as well. Im going to do it. Thanks for the tip. I have the opposite problem though. My grarage is freezing.